It's a balloon-borne magnetic rigidity spectrometer designed to measure cosmic ray antiprotons and light isotopes over an energy range from about 200 MeV to 3 GeV. To discriminate between antiprotons and background contamination from electrons and negative mesons it uses the velocity of the incident particle, while for isotopic measurements, mass identification is by the velocity vs. magnetic rigidity technique, supplemented at lower energies by ionization energy loss vs. magnetic rigidity. 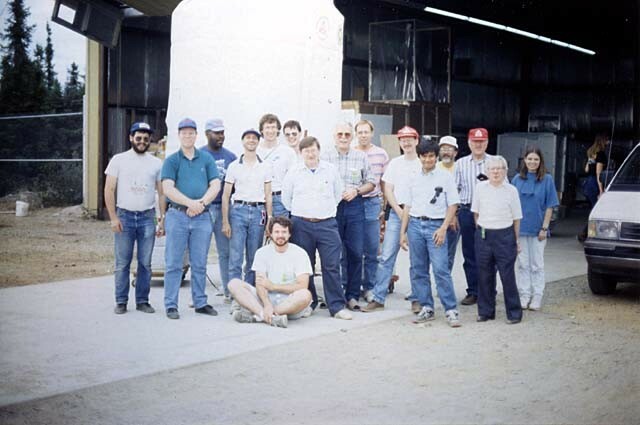 The instrument design -as many others of those years- was an adaptation of the basic configuration of the Balloon-Borne Magnet Facility (BBMF), a payload developed by New Mexico State University and NASA's Goddard Space Flight Center to perform research on high energy particles using a magnet spectrometer. A schematic drawing of the IMAX instrument is shown at left (click to enlarge) showing their main components. It is composed by a single-coil superconducting magnet, providing a magnetic field varying from 0.1 to 2.1 Teslas in the region of the tracking detectors. The tracking system is a combination of drift chambers (DC) and multiwire proportional chambers (MWPC). The drift chamber subsystem consists of two identically manufactured drift chamber modules with a hexagonal close-packed structure, which provides 12 measurements in the bending direction (x) and eight in the nonbending direction (y). Eight MWPC layers were used: three above the top DC, three at the center of the magnet between the DCs, and two below the lower DC. Particle trajectories are measured in general with the full hybrid tracking system (DCs plus MWPCs), whereas both tracking subsystems can operate separately in order to provide two independent trajectory measurements. In addition, each single drift chamber module is capable of measuring the trajectory of a charged particle in the field of the magnet. On regard particle velocities, they are obtained from a high-resolution time-of-flight system (TOF), a Teflon Cherenkov counter (C1), and two silica-aerogel Cherenkov counters (C2 and C3). The high-resolution time-of-flight (TOF) system, divided in the bottom and the top arrays consist of three 60 cm x 20 cm x 1 cm plastic scintillator paddles, with each paddle viewed by two photomultipliers PMTs on opposite sides. Two large-area Cerenkov counters (C2 and C3) are located above and below the tracking systems, each containing a layer of 50 cm x 50 cm x 9 cm of silica aerogel. The C2 counter is viewed by 14 photomultipliers (PMTs), while C3 is viewed by 16 PMTs. All of them are individually pulse-height analyzed. A third Cerenkov detector (C1) used two 56 cm x 54 cm x 1 cm layers of Teflon radiators located in a light integration box viewed by 10 PMTs. Besides the two plastic scintillators of the TOF system, which formed the event trigger, two large-area light-integrating counters (S1 and S2) were used to separate particles by charge. S1 contained a 51 cm x 51 cm x 1 cm plastic scintillator, viewed by 4 PMTs, while S2 used a 55 cm x 49 cm x 1.8 cm plastic scintillator material, viewed by 12 PMTs. located between the time-of-flight layers give four independent measurements of particle charge and ionization energy loss. Additionally, a group from University of Arizona designed an special-purpose detection module to discriminate the pulses generated by each scintillator's PMT to perform searches of slowly-moving dark matter particles. An aluminium cylindrical gondola measuring 3.67 meters in height and 1,52 meters of diameter enclosed the magnet, detectors and a VAX computer that processed the incoming data. The balloon was launched by dynamic method with assistance of a crane acting as launch vehicle at 21:36 local time on July 16, 1992. The initial ascent phase was too slow wich forced to early dump some ballast to increase the ascent rate, however by 1:20 am it was merely at 93.000 ft. Seven hours later at 4:30 was reached the final float altitude of 36 km. By that time the balloon was drifting westward on prevailing winds. After an all night long flight by 15:15 of July 17, the scientific team started to lose the telemetry link as the payload gets past the Ft. McMurray zone were the downrange telemetry station was located. 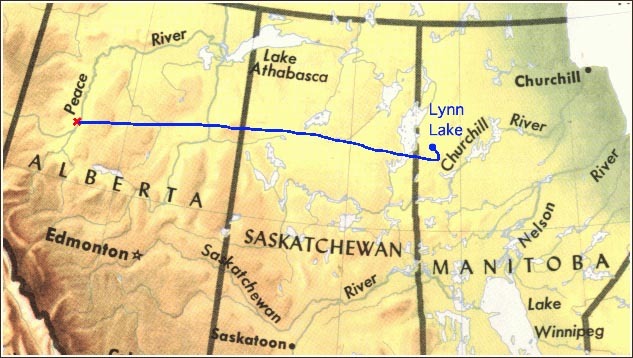 Near 23:00 of that night, the payload was succesfully cut-down over the west part of Alberta province, landing in excellent shape at Grimshaw, near Peace River border. 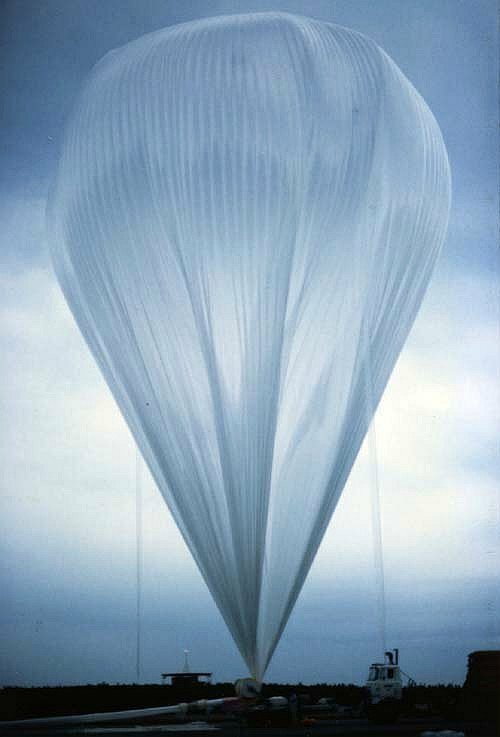 The instrument took data throughout ascent, recording about 1.4 million events while during the float period over 3.4 million events were obtained. Measurement of the Cosmic Ray Induced Muon Flux through the Atmosphere using IMAX 26th International Cosmic Ray Conference. August 17-25, 1999. Salt Lake City, Utah, USA.